Am getting a bit behind with my updates, need to get the ball rolling once more! 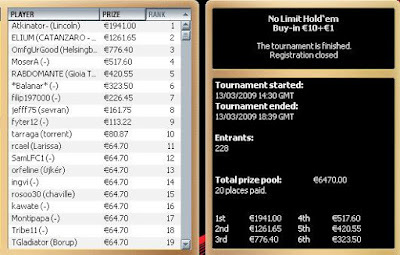 Have been playing a fair few MTTs the last couple of weeks, and was very pleased to take down a €10 rebuy with 228 runners for over €1900. Went into the final table 7/10 in chips, so wasn't really expecting a huge score, but things just went my way I guess. I really took home my advantage 4 handed as the others seemed to have one eye on the payout chart. Playing MTTs full time is the one form of poker I haven't really tried my hand at yet, so this experimentation with MTTs has been interesting. I might have a proper crack at being an "MTT pro", at least for a short while, in the next 2 or 3 months. Have been playing a little more limit hold 'em with my own bankroll over the last couple of weeks, although only about 7-8,000 hands as I game select very earnestly. Still, its been going well for me, especially considering I was all for quitting LHE after a downswing about a month ago. It's not something I could play solely without mixing in other forms of poker, but it's nice to know I have a reasonable hourly rate playing it (with a decent sample size to draw that conclusion from). I will try and play some more Heads-Ups before the month ends, and I pay out on my Blonde Staking deal. I will soon have one eye on the BlackBeltPoker.com grading which I will be partaking in from the end of April. It's been a while since I played some of the format's they are wishing players to play, so I will probably train myself up a little before it all begins! 4 Comments to "€10 Rebuy win and general update..."
Is this where u play alot of your games btw James. I've played a few mtt's on there myself and found the standard shocking! What's the traffic like on Boss during the early morning (0600-1000) or aren't you aware of it? I get to play at that time then again in the evening and I'm always open to new sites/skins I've not played at! Yeah standard on Boss is generally pretty shocking.